It's no secret here that I am a believer in being healthy from the inside out. I like to try natural remedies, sometimes to the point that Jeremy gets annoyed. For instance, last night I've been trying to cure a skin condition with raw apple cider vinegar at night and tea tree oil during the day. It works, but he fussed that I stunk to high heaven. I could smell the oil today through my jeans at school. Obviously people probably think I smell weird outside of Jeremy, but I just can stomach going to the doctor if I don't have to. This week has been one of those dietary gross weeks. After 4 days of state testing and chewing gum constantly while pacing like an angry lion I've become bloated and ick. When I start feeling gross my brain immediately goes to some over the counter solution for instance today it was a laxative. TMI I know, but while it might help for the short term it does more damage in the long term for a teacher who probably just drank too much coffee and inhaled far too many pieces of mini tootsie rolls during testing. After the initial "well that won't work" though I remembered a little concoction I came across during spring break when I over purchased on the cucumber and celery front. I decided to juice a cucumber. It was and is the only bloat reducer currently lingering around the fridge. Now why cucumber juice? And why did I put what I put in it? ***I am in no way a doctor, or even claim to be one. This is just what I do for myself based on what I know and have read. Ginger is great for nausea, digestion, and as a decongestant. Cayenne pepper is anti-flu, anti-fungal, anti-inflammatory, aids in digestion, a pain reliever, and is great for a sore throat. It is also wonderful for detoxing because it is considered a circulatory stimulant. You can read more about cayenne pepper here. 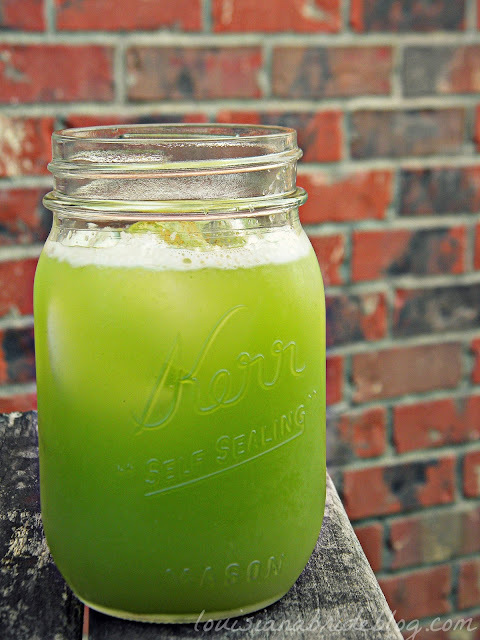 Lime juice is a good source of vitamin C and helps to cure scurvy and gout. According to Organicfacts.net lime contains acids that breakdown the macro molecules of food, it also stimulates the digestive system and increases the amount of digestive juices. Plus it's good for your skin! Parsley contains vitamin A, C, and K which aids in having a healthy immune system. Basically when it comes to real food you can't go wrong. I just know that when I'm feeling bloated I go for high water foods like cucumber, celery, watermelon, and other melons. 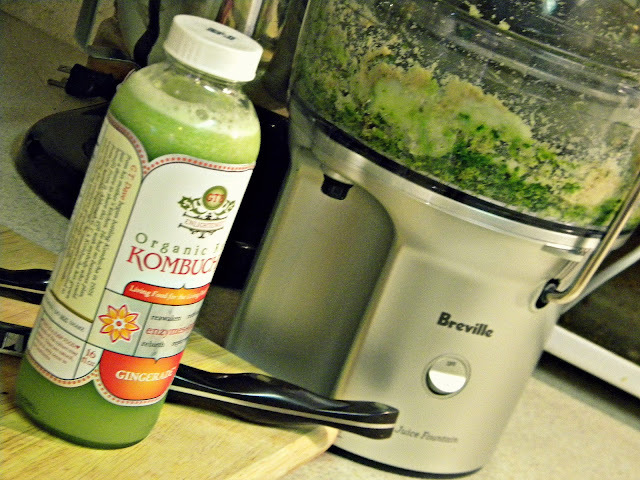 Peel cucumbers, remove skin from lime, and turn on juicer. 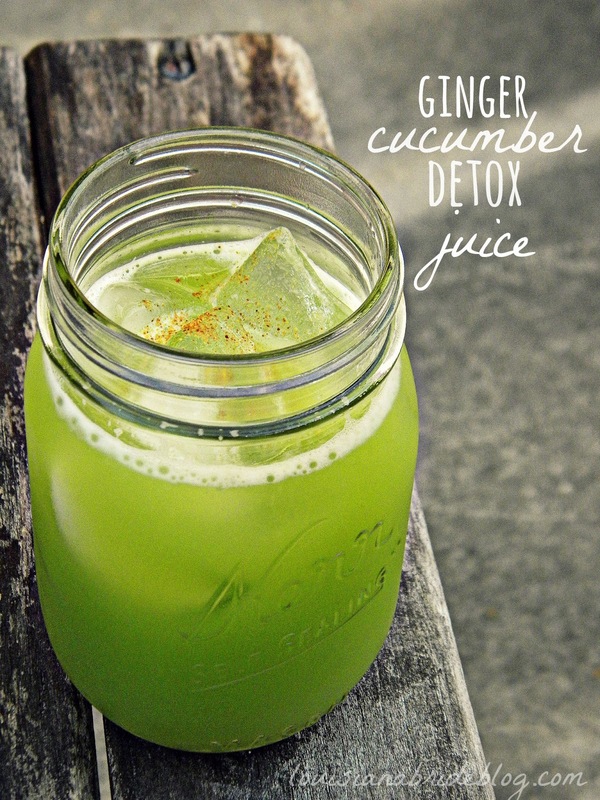 Juice parsley, ginger, lime, and cucumbers. 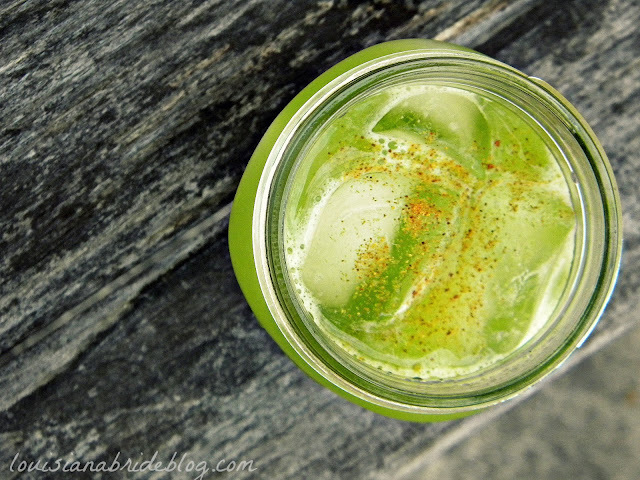 Pour over ice and add a dash of cayenne pepper, or more to your liking. I like to run my more watery veggies through my juicer last in hopes of pushing out the bits of parsley and ginger that didn't quite go all the way through. If I would have had celery on hand I would have tossed that in, let it be known though that it tastes a bit like salt water. Just because I'm the curious type, and I'm sure other people are too. I didn't get to drink my juice right away. I actually planned to drink it before bed and due to day light hours juiced while I could still see. So what is a blogger to do? Store it in a old Synergy Kombucha bottle. I'm still meaning to peel the labels off, some day. Also note why I don't photograph things indoors. Photo quality in our poorly lite dungeon of an apartment is less that blog worthy. So tell me, what's your favorite juice recipe?